All licensed pesticide applicators, as well as dealers, who store pesticides are required by law to send a copy of their storage inventor(ies) with an explanatory cover letter to the local fire company by May 1st each year. In New Jersey, all licensed pesticide applicators and dealers who store pesticides are required per N.J.A.C. 7:30-9.5 to maintain a list of the pesticides stored, or likely to be stored, during the license year. A storage inventory should be kept separate from the actual storage area. The Rutgers NJAES Pesticide Safety Education Program ‘Records & Forms‘ webpage provides two editable templates for submittal to the Fire Department that meet the minimum regulatory requirements. You may also devise your own format to suit your own needs as long as it meets the requirements of N.J.A.C. 7:30-9.5. Pesticide Storage Inventory Form – The purpose of the inventory is to provide local fire departments with an accurate description of things stored by location in case of fire or other emergency. We suggest filling out one form per storage address of your establishment. Cover Letter – All licensed pesticide applicators and dealers who store pesticides are required by law to send a copy of their storage inventor(ies) with an explanatory cover letter to the local fire company. Specifically, NJDEP regulations provide: “The cover letter shall explain that this list has been sent pursuant to N.J.A.C. 7:30-9.5(b).4”. 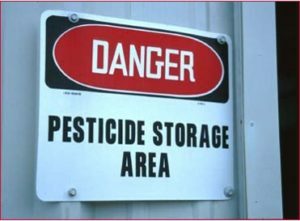 New Jersey regulations also specifically require a written description or diagram depicting the exact location of the area on the property where the pesticide is stored. Rutgers template cover letter provides a space to write that description, or indicate that a diagram is enclosed. Submittal to the fire department is required annually by May 1st of each year (this does not pertain to pesticides stored for personal use, or to those storing pesticides at loading or application areas for less than 7 days). Applicators and dealers must keep the cover letter on file for a minimum of three years and should have it available for NJDEP upon request. The ONE Date Jersey Licensed Pesticide Applicators NEVER forget – May 1st!!!!!!!! !